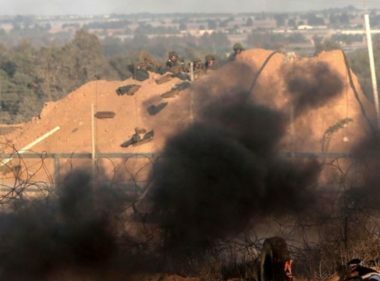 Israeli soldiers shot, on Thursday evening, at least two young Palestinian men, including one who suffered life-threatening wounds, in Central Gaza. Dr. Ashraf al-Qedra, the spokesperson of the Health Ministry in Gaza, said the soldiers shot one Palestinian with a live round in the head, before he was rushed to the Indonesian Hospital. Eyewitnesses said Israeli army sharpshooters, stationed in fortified posts across the perimeter fence, targeted Palestinian protesters, wounding two, including the one who suffered a serious injury. The second Palestinian was shot with a live round in the thigh, and suffered a moderate wound.